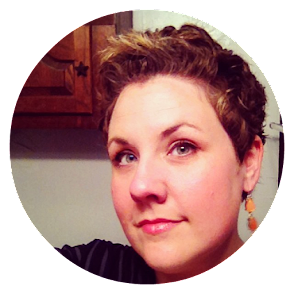 Estella's Revenge: Sunday Brain Dump: Books, Food, Organize EVERYTHING! Sunday Brain Dump: Books, Food, Organize EVERYTHING! Happy Sunday! This week has been...scattered. I think it's called having too many balls in the air. I am fairly obsessed with cleaning out, streamlining, donating, and organizing. This stretches all the way from my our living room redo (almost done!) to my work. I completed my journey toward Inbox Zero (personal email) this past week, I'm listening to Getting Things Done by David Allen, and I cleaned out clothes, toys, and shoes so Arms of Hope can pick up our donation items on Wednesday (including the old couch and entertainment center...yay!). I'll probably do a whole post on this organization thing. Homemade venison sausage pizza, steamed green beans, a cutie. My husband and I mutually decided to make a push to get back on the "real food" wagon in 2016. I personally need to lose about 50 more pounds (already lost 40 and maintained that over the last several years), so this is just the next step. I also want to focus on eating more iron rich foods so I (hopefully) won't slip back into anemia territory before my next round of labs in March. This means more meal planning and more bulk cooking at home on the weekends so we still have quick, frozen things we can grab for lunches during the week but that all the frozen stuff is much better for us. I'll do a whole post on this, too. On the reading front, I've had the gobbledybooks. I did manage to finish The Unfinished World by Amber Sparks this weekend. It was amazing and scratched just the right itch, so you'll see a review this week. I need to finish listening to Getting Things Done by David Allen. It is really changing the way I think about work flow and productivity. The edition I'm listening to is a little older, so I'm also scanning an updated edition with more of a digital focus. I'm reading Tiny Beautiful Things by Cheryl Strayed, which I started several years ago and never finished. It's the perfect book for insomnia nights and small blocks of time when I'm waiting around and don't have a whole lot of focus. Still working through Order of the Phoenix. It's taking a ridiculously long time, so I'm going to switch to audio and listen to it on my commute when I'm finished with Getting Things Done. Finally, I put my nose back in Americanah by Chimamanda Ngozi Adichie which I've tried and laid aside probably four times. It's one of very few books I refuse to DNF because I feel like I just have to be in the right mood for it, and I honestly think (hope) I'll love it. A post on this coming. Do you see a pattern here? Sounds like a pretty good week to me! I'm still reading City on Fire... it's very good, but unbelievably long. Starting to get a little restless. I am a huge follower of Getting things done. I have been using his steam for years! I wish I had read it in college but oh well. Here's my two cents on Americanah: Give it up. I loved everything else by this author, but I just hate to be preached at. Even if someone has a right, even a responsibility, to preach. Even if the preaching is quite good. I definitely have the January clean and organize bug too! Of course, it's going to be a bit easier when the boy is back at school. I just finally finished a book, last night: Front Lines by Michael Grant. It was light reading but I'm always an insomniac and losing a friend so suddenly did not help my reading week. I just couldn't get Tammy out of my head. We've started to tackle the winter clothing in our closet. Before the real cold set in, we decided we'd see what we managed to wear and then get rid of everything else. So far, so good. A few fleece shirts and a sweater or two are more than enough for each of us. Hopefully, someone can use all the rejects. They're near-perfect because we've worn them so little. Next up is the library. I tremble at the thought of all I have to do in the library. 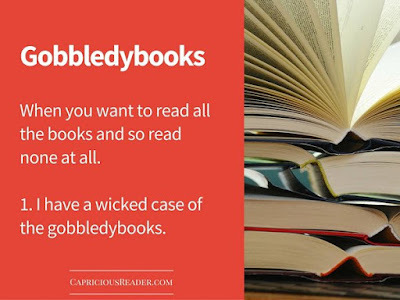 A case of the Gobbledybooks - love it and can totally relate to that! I hope next time you get back into Americanah you will finish it. It's a wonderful book. The Order of the Phoenix is sooo long. I read somewhere that if the font size was the same as the other Potter books it'd be 1200 pages. Getting Things Done sounds like my cup of tea, I'll have to check it out. I'm also obsessed with cleaning/organising/streamlining at the moment. I'm trying to clear out a lot of clutter which is an immensely satisfying process. Have a lovely week! So nice to ride that organizing/purging train when it hits... I went through some nesting myself... and am waiting for that mood to strike again (hopefully before baby comes!). I hope your meal planning adventures goes well... it's just a matter of getting into a good routine, which I guess is true of all things. The Hubs and I are trying the meal delivery Home Chef for the first time this week... so we'll see how that goes. I love your description of Tiny Beautiful Things; this is exactly the reason why I own two copies: one hardcover and one electronic. I like to be able to pick it up anywhere and read little snippets. I'm so glad you're enjoying it! Gobbledybooks...perfect. Oooh, I love the feeling of wanting to ORGANIZE...when it hits. I had a good case of it a few weeks back and I'm hoping to be hit by another dose very soon. Good for you on the real food front. We made a big change in our eating habits a year and a 1/2 ago. (Something like that.) It changed so many things in our lives! It takes planning and prep but it's totally worth it if you can pull it off :D Best of luck!! My 30 year high school reunion was just announced so you know what that means. My diet dial just got turned up. Haha! I'm in the same reading place you are...flailing around!! 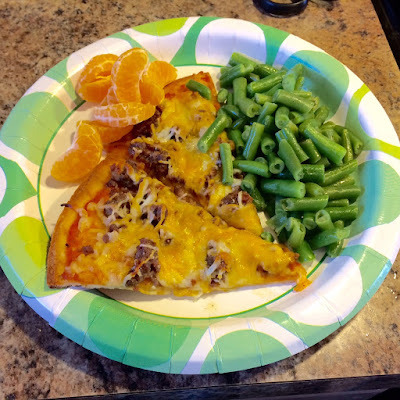 But, your venison sausage pizza looks divine and my husband and son would both love the whole venison angle. Congrats on trying to eat more whole foods...I'm trying to do the same...it's tough when you're on the go all the time though! I have to admit that I do a pretty good job when it comes to eating real foods. My problem is portion size. And right now when I am eating all the feelings I should be having but am not because I am just numb to everything. I love the feeling of a well-organized office/home/life. It is so cathartic to me. I desperately need your organization post. I did a Pinterest organization one year - I looked at every organization post with hope and failed miserably. Too many methods working against each other. I hope you rid yourself of the gobbledybooks, soon. I love that word. Yay for organizing! We're still...always...working on organizing. The thing is they are so many methods out there. It can be just a project picking out which one to use, although we did like at least starting with Marie Kondo's method. Also yay for real food! We're working on that too. My reading has been put on hold by real life, but I'm hoping to read Between The World and Me today as I have the day off before heading back to work tomorrow.